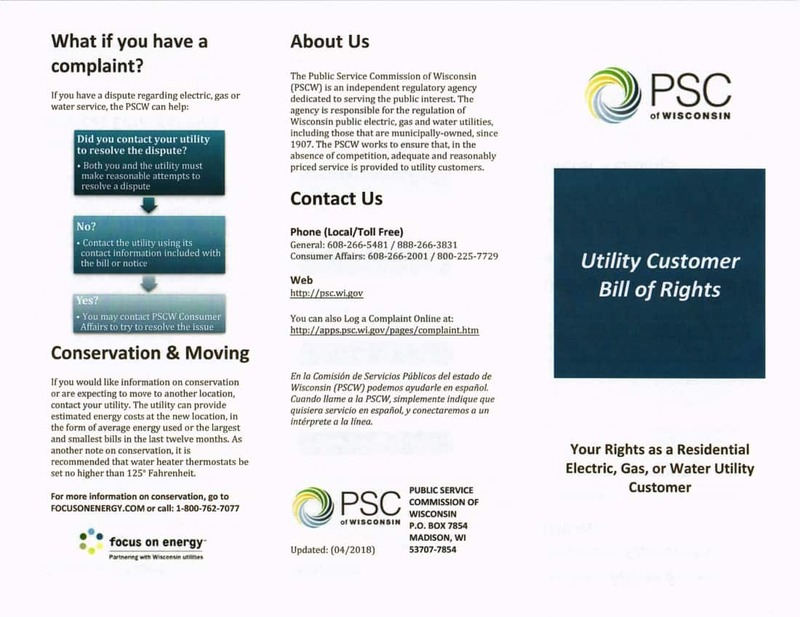 Utilities set out the rates, terms and conditions of service in Wisconsin Public Service Commission-reviewed filings referred to as tariffs. The tariffs found by following the link below at this PSCW page are available in Portable Document Format (PDF). You will need Adobe to read them. The tariffs are in utility name order. 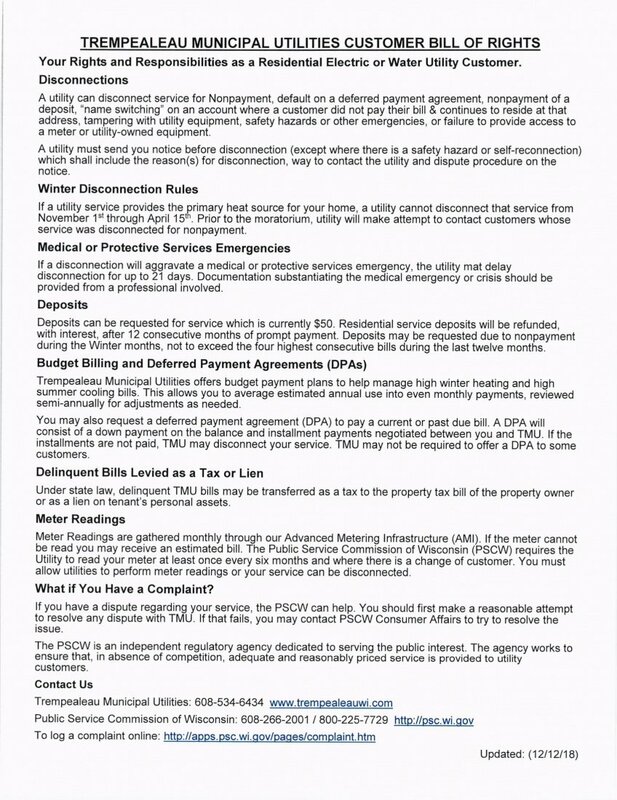 TMU Electric and Water Rates are found here. Sewer Rates are available upon request. 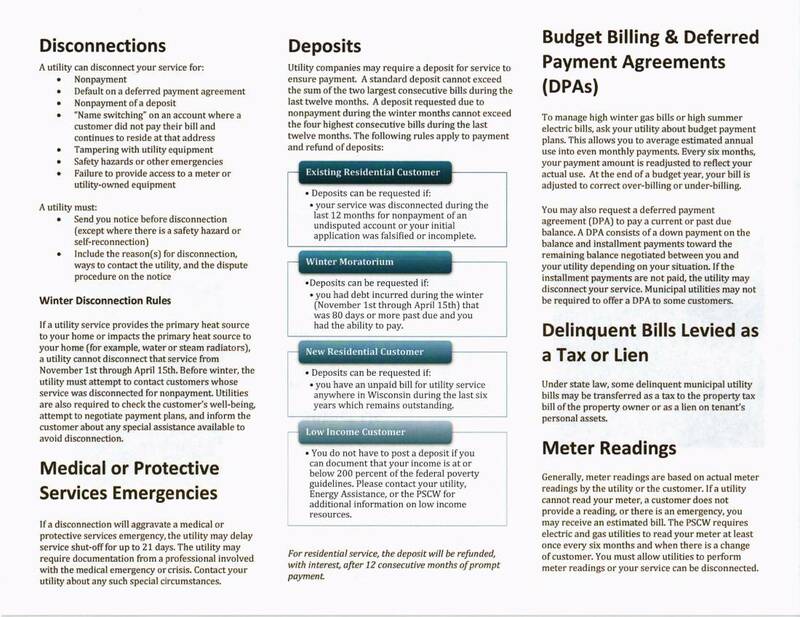 Billing is monthly and one bill is issued for all services provided to each customer. Bills are issued on 15th of each month and due 20 days later. Fixed charges are charged from the 15th to 15th. Meters are read at the end of the month and use is charged from 1st of month to month end. Trempealeau Municipal Utilities serves residents of the Village of Trempealeau Electric, Water and Sewer. Also, some outlying residents Electric Service. If you would like to know more about the information contained in this report, please contact Todd Lakey at (608) 534-6434. The Village Board meets the first Thursday of the Month at 7:00 pm in the Board room of the Trempealeau Community Center located at 24455 Third Street, Trempealeau WI 54661. The 2017 Consumer Confidence Report will not be mailed. Additional copies of the 2017 CCR are available upon request by contacting the Trempealeau Village Hall at 608-534-6434 or email [email protected] . Some people may be more vulnerable to contaminants in drinking water than the general population. Immuno-compromised persons such as persons with cancer undergoing chemotherapy, persons who have undergone organ transplants, people with HIV/AIDS or other immune systems disorders, some elderly, and infants can be particularly at risk from infections. These people should seek advice about drinking water from their health care providers. EPA/CDC guidelines on appropriate means to lessen the risk of infection by cryptosporidium and other microbial contaminants are available from the Environmental Protection Agency’s safe drinking water hotline (800-426-4791). To obtain a summary of the source water assessment please contact, Todd Lakey at (608) 534-6434. AL Action Level: The concentration of a contaminant which, if exceeded, triggers treatment or other requirements which a water system must follow. Level 1 Assessment A Level 1 assessment is a study of the water system to identify potential problems and determine, if possible, why total coliform bacteria have been found in our water system. Level 2 Assessment A Level 2 assessment is a very detailed study of the water system to identify potential problems and determine, if possible, why an E. coli MCL violation has occurred or why total coliform bacteria have been found in our water system, or both, on multiple occasions. MCL Maximum Contaminant Level: The highest level of a contaminant that is allowed in drinking water. MCLs are set as close to the MCLGs as feasible using the best available treatment technology. MCLG Maximum Contaminant Level Goal: The level of a contaminant in drinking water below which there is no known or expected risk to health. MCLGs allow for a margin of safety. MRDL Maximum residual disinfectant level: The highest level of a disinfectant allowed in drinking water. There is convincing evidence that addition of a disinfectant is necessary for control of microbial contaminants. MRDLG Maximum residual disinfectant level goal: The level of a drinking water disinfectant below which there is no known or expected risk to health. MRDLGs do not reflect the benefits of the use of disinfectants to control microbial contaminants. TT Treatment Technique: A required process intended to reduce the level of a contaminant in drinking water. If present, elevated levels of lead can cause serious health problems, especially for pregnant women and young children. Lead in drinking water is primarily from materials and components associated with service lines and home plumbing. Trempealeau Waterworks is responsible for providing high quality drinking water, but cannot control the variety of materials used in plumbing components. When your water has been sitting for several hours, you can minimize the potential for lead exposure by flushing your tap for 30 seconds to 2 minutes before using water for drinking or cooking. If you are concerned about lead in your water, you may wish to have your water tested. Information on lead in drinking water, testing methods, and steps you can take to minimize exposure is available from the Safe Drinking Water Hotline or at www.epa.gov/safewater/lead.